This month the featured mineral is Rainbow Fluorite. Fluorite is a derivative of the Latin word “fluere” which means to flow. Because of its easy melting properties, fluorite can be used during the manufacturing of steel; although its most popular use is in making jewelry. This is because fluorite is the most colorful mineral of the world and often displays distinct banded color, such as in this month’s featured mineral specimen. Fluorite can be purple, green, yellow, brown, pink, reddish-orange, and even colorless. It is a soft stone with a glassy luster and translucent. It is second only to quartz minerals in popularity. Fluorite is found worldwide, but especially in Brazil, Canada, China, England, Germany, Italy, Mexico, Norway, Russia, Argentina, Switzerland, and the USA. At the Tucson show in February, I purchased a flat of Rainbow Fluorite slabs. 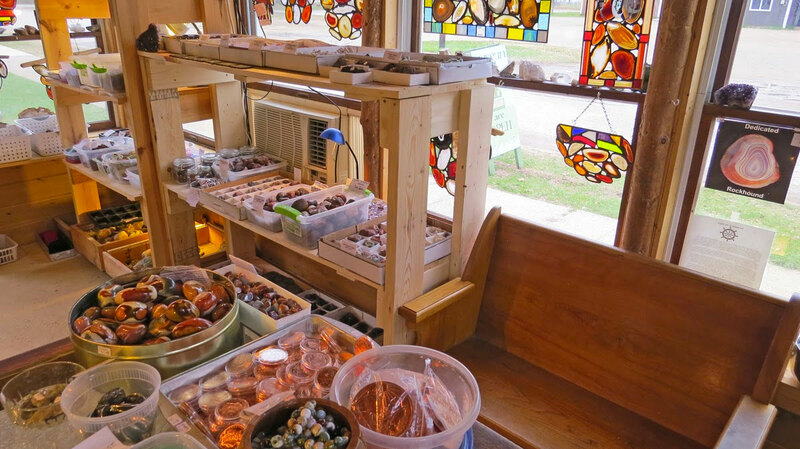 A few pieces were used in the agate window pictured on this page. This particular window was sold at the Escanaba show. More will be used to make a lamp and other products. The slabs are considerably more expensive than agate, but well worth the price. Some say that fluorite improves self-esteem, reduces stress, stimulates the imagination, and protects against illness. Others claim it has a calming energy that facilitates order and improves balance.